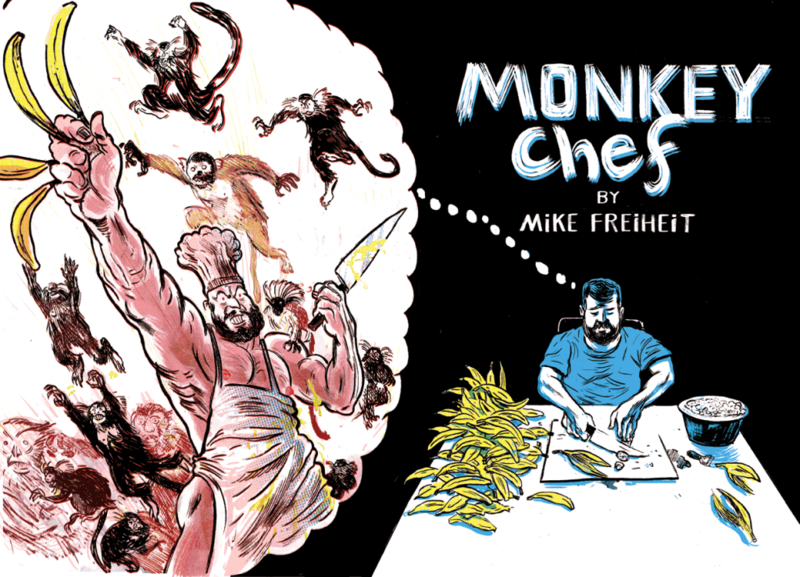 From 2010 until 2011 Mike Freiheit was a Monkey Chef. Mike lived and worked at a primate sanctuary, in Pretoria, South Africa, where he prepared the food daily for the monkeys (as well as other primates), and cooked dinner for the human volunteers at night. Monkey Chef is an on-going, self published comic, containing short stories from Mike’s various experiences abroad. Whether it’s dealing with daily primate caretaker duties, navigating the dangerous world of co-habitation with the other volunteers, or becoming accustomed to the bare bones life style at the sanctuary, Mike handles each story with heart, humor and a unique, fresh perspective. We aren’t so un-alike, humans and monkeys. Both issues of Monkey Chef are now available to buy here!